Just been to my local Aldi in Alverthorpe, Wakefield, and saw they had pallets of Supagrill Charcoal Briquettes and Charcoal outside. 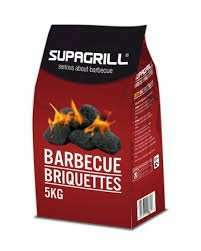 The briquettes are about as good as you can get in the UK and normally retail £5-6 per bag. They are selling them off at 99 pence. I have a smoker and smoke throughout winter- but well recommended to stock up for next year at these prices. Lumpwood all the way. Some of the stuff they put in a lot of briquettes is quite simply alarming. Briquettes? Never trusted them.Lumpwood all the way. Some of the stuff … Briquettes? Never trusted them.Lumpwood all the way. Some of the stuff they put in a lot of briquettes is quite simply alarming. Totally wrong mate in relation to these- good briquettes don't have crap in and burn much longer. These are fine in that regard, albeit I normally use Aussie Heatbeads. Look at any smoking expert, briquettes normally used. You will however be pleased to hear they also have the lump wood at the same price. Totally wrong mate in relation to these- good briquettes don't have crap … Totally wrong mate in relation to these- good briquettes don't have crap in and burn much longer. These are fine in that regard, albeit I normally use Aussie Heatbeads. Look at any smoking expert, briquettes normally used. You will however be pleased to hear they also have the lump wood at the same price. ​Yeh, was just being cautious. Some of them really do have some really strange things in e.g. glue! ​Yeh, was just being cautious.Some of them really do have some really s … ​Yeh, was just being cautious.Some of them really do have some really strange things in e.g. glue! These are just highly compacted good quality charcoal. At all cost avoid those on garage forecourts, quick light etc.